This player was originally built around 1970 by Oliver R. Graham of Westerly, Rhode Island. The mandrel and its mount is the top deck assembly from an Edison Home phonograph. The motor is a 600 rpm hysteresis motor, probably from a tape recorder, with the drive pulley turned to the diameter that will make the mandrel turn at 160 rpm. The rubber drive belt was taken from a Roberts model 144 tape recoder. 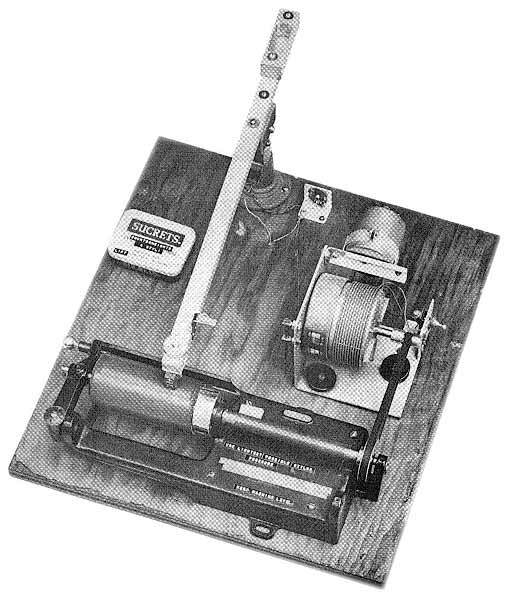 In Oliver Graham's original version, the player was equipped with a modified Barber and Howard transcription arm (not shown in the photo above, which is by Raymond Scory, from the cover of Record Research, Nov. 1973). The cartridge used was a crystal unit turned on its side in order to pick up the vertical movement of the cylinder groove. It was fitted with a cactus needle, and proved difficult to use. 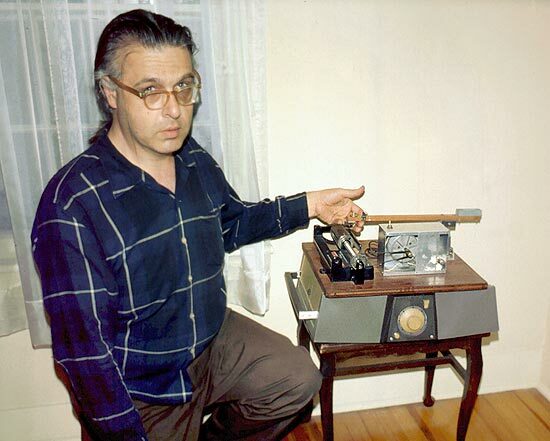 In 1972 George Blacker in Cheshire, Connecticut, took over the player and equipped it with a wooden arm of his own construction, as shown in the photo above. He felt that wood would be the best material to keep the mass of the arm as low as possible in order to provide good tracking capabilities at low stylus pressure. The counterweight at the back of the arm balances it to zero stylus pressure, and round weights are then added at the front, on top of the cartridge, to provide necessary pressure for diferent cylinders. The pickup is a modern stereo cartridge wired for vertical mono recordings and giving a one-channel output via an RCA jack at the rear. After George Blacker's death the player was acquired by Bill Bryant, who made numerous transfers with it, apparently always with some difficulty. George Blacker with the player in a 1976 photograph courtesy Tim Brooks (www.timbrooks.net) .